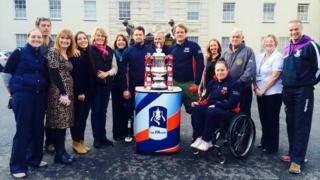 Tedworth House is one of four Recovery Centres run by Help for Heroes. The House provides support to serving and veteran members of the Armed Forces who have been wounded, injured or become sick. Tedworth House is fully adapted and offers over 50 en-suite bedrooms and four family suites. The Centre has a range of specialist rooms for adaptive sports, education courses, relaxation and socialising which have been designed to ensure the best possible recovery. Tedworth House is also home to the Phoenix Centre - a state of the art gym complex with some of the UK's most advanced adaptive sporting facilities. The Centre includes a Skiplex, SwimEx, strength & conditioning gym, steam room, sauna and sports hall with a sprung floor. These world class facilities have been provided thanks to the incredible support of companies who have gifted much of the furniture, fixtures and decorations.